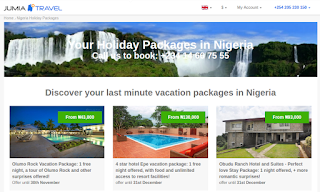 To celebrate the World Tourism Day, Africa's leading online hotel booking company Jumia Travel, has announced the launch of its first holiday packages in Nigeria. The package rates are inclusive of hotel stays, spa treatment, meals, transport and a tour guide where applicable. This initiative will focus on popular destinations such as Obudu Cattle Ranch, Olumo Rock and Ikogosi Warmspring in Nigeria. According to Paul Midy, Jumia Travel's CEO, "the move is part of the company's initiative to promote domestic tourism in Nigeria, as we approach the peak season". He added that "this will therefore be quite ideal for families, couples, group of friends and even corporate groups vacationing in the months of August to December". Last minute plans will also be well catered for due to the flexibility offered by the packages; for instance, by either directly calling Jumia Travel's Customer Service or by filling in a simple query form, the team will be able to organize for transport and/or accommodation at the same time, easing the hassle of travel and most importantly giving customers a memorable vacation experience. 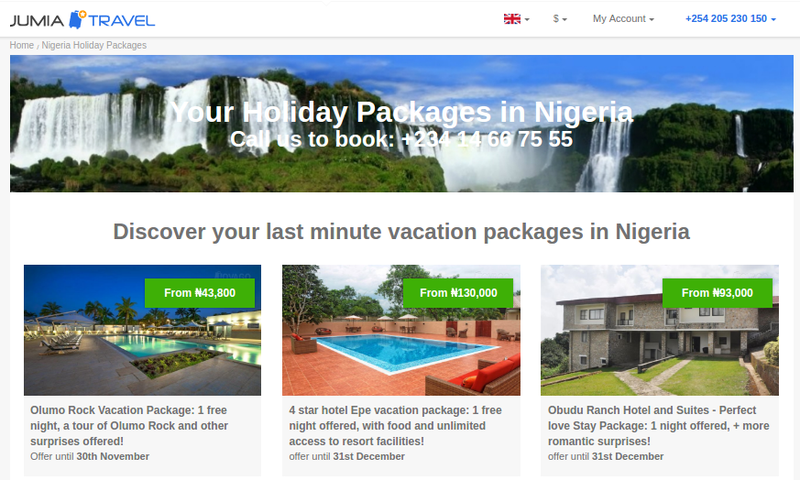 Managing Director for Jumia Travel Nigeria, Kushal Dutta said launching the holiday packages in the country at this time of recession will promote this year's World Tourism Day theme of promoting universal accessibility; by providing Nigerians plenty of options to choose from, especially those who can't afford to travel out of the country for vacation due to the increase in foreign currency exchange. While these are the first packages by Jumia Travel launched in Nigeria and Kenya, the plan is to roll out the packages in all other African countries. The company that now boasts the largest inventory of hotels in Africa plans to run the promotion on a yearly basis; while regularly updating the packages on the respective Jumia Travel's country websites. Our ambition is to bring every bit of available accommodation online, and to create the easiest and cheapest way for customers to book it. At Jumia Travel, we have hundreds of travel specialists constantly in touch with our customers. Our offices are located in Lagos (Nigeria), Accra (Ghana), Dakar (Senegal), Abidjan (Ivory Coast), Algiers (Algeria), Douala (Cameroon), Kampala (Uganda), Dar Es Salaam (Tanzania), Nairobi (Kenya) and Addis Ababa (Ethiopia). Before June 2016, Jumia Travel was known as Jovago. Jumia Travel was founded in 2013 by Jumia and is backed by MTN, Rocket Internet, Millicom, Orange, Axa and financial partners.